We carry an extensive inventory of craft beers from all of your favorite breweries. No matter if you have a taste for the hops, or prefer a dark, robust stout, we have an excellent selection of some the world’s highest rated brews on our shelves. You’ll find regular and seasonal offerings from Dogfish Head, Ballast Point, Three Floyds, Great Lakes, Schlafly and Bells, just to name a few. We always have hundreds of six packs and bombers on hand for your next event, whether that’s having friends over for the big game, a quiet evening around the fire, or any other occasion, large or small. Our shelf talkers keep you informed on ratings and descriptions of many of our incredible offerings. You never know what the next great beer you haven’t tried will be! If you prefer your brew from the tap, then you’ll be pleased to hear about our rotating cast of kegs available for your enjoyment. Grab a growler and impress your friends with one of ten of our craft brews from many of your favorite beers without having to commit to a keg. Better yet, bring your growler back each Friday and receive 10% off of your refill! Get your weekend started off on the right foot with your favorite craft beer straight from the tap. You’ll find selections of classic players like Bells and Stone, as well as local offerings from Paducah’s own Dry Ground Brewery. To see what is currently pouring, check out What’s on Tap. Don’t want to commit to a 6-pack of the same thing? We have you covered. You can build your own 6-pack to give yourself some options. 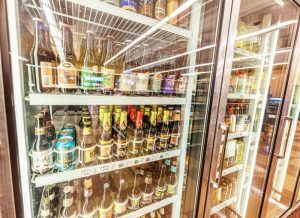 We keep a whole section of our cooler dedicated to individual ice cold bottles and bombers for your sampling pleasure. It’s a great way to have your own beer tasting with friends!